with a refined taste for restraint elegance meet their expectation of creating a graceful impression and charm their dignified guests with the very first and the only personal correspondence, the Wedding Invite. Frescoes creates concept of personalized couture invitations and stationery with matching accompaniments to the marriage invitation cards including boxes of traditional Indian sweets, dry fruits, money stuffed envelopes, and some gift items. Elegant, sophisticated, luxurious wedding Invitation Cards for the ultimate elite Couture wedding. 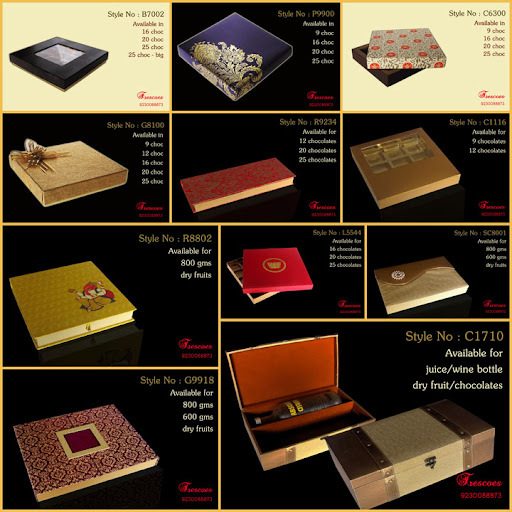 A complete and a well organized package that stores the Wedding Invitation Card and the Gourmet Gifts neatly. FRESCOES is a graphic design studio creating bespoke and one-of-a-kind wedding invitation stationery for the most discerning Indian couples. Contact for bespoke exclusive wedding invitation cards designed especially for you. I saw some of your yotube videos and the cards are beautiful. Wish I could see some pictures of your cards. Do you deliver all over India? Please mail at krishna.keyal@gmail.com with your requirement details like quantity of wedding invitation cards needed, date of wedding, your location.